The CAF Champions League and Confederation Cup now over. Here, we profile the outstanding individuals. The last line of a Wydad defence which rarely put a foot wrong. While Laaroubi isn’t a spectacular keeper, his calmness and general solidity characterised a defence which was collectively solid rather than individually spectacular. Quietly one of the continent’s best right-backs since the turn of the decade but hard to notice him due to his unassuming nature. His ability to play on the other flank does TP Mazembe no harm. Mr TP ,Mazembe. The centre back has defended the black and white colours since Sandals For Goalposts wasn’t even a concept, and he has become more dependable with age. His moment of madness for a second yellow, leaving Wydad to see a nail-bilting second half with 10 men, nearly made him the enemy of the red half of Casablanca. That aside, he was at the heart of a dogged Wydad defensive engine. Not just the best left back in Africa but surely one of the continent’s players of the decade. Rarely has a quiet game. Like Maaloul, always excellent for club and country. His late long ranger against Al Ahly in Sousse gave Etoile hope, capping another fine midfield display in a match Etoile lost impetus in. Belied his 35 years of age with the level of his performances. 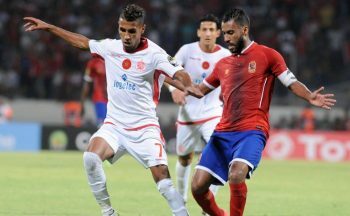 Typified the battling, every-ounce endurance of Wydad Casablanca, particularly at Stade Mohammed V, incorporating some dark arts with some crowd-rousing, robust challenges. He added a sense of fun in a functionality Wydad team. Impossible to envisage Wydad triumphing without Bencharki and Ounajem’s quality in attack. The revelation of this CL campaign. He registered 4 goals despite playing behind the striker, his pace and directness was a constant source of danger. Surely will be named the CAF Africa African-based Player of the Year. Makeshift striker who has now quite possibly forged a reputation as a full time striker. Decisive in every semi final and final leg for Wydad. Finished as top scorer with seven goals despite bowing out in the quarter finals. ‘The Sniper’ is evidently one of Africa’s top strikers and he seems to get better each year.